Kashid is a beach town on the shores of the Arabian Sea, in the North Konkan region of Maharashtra, India. It is located 30 km from Alibag and 135 km from Mumbai on the Alibag-Murud road. Kashid is popular mainly because of its white sand, blue seas, green mountains, paddy fields, and rivulets. Kashid has a 3 km stretch of beach tucked in between two rocky hillocks with Casuarina groves all along the seashore. This is by far the best beach in this part of the Konkan region and, though absolutely deserted on weekdays, the town can attract its fair share of week-end holiday makers. There are a few small hotels in Kashid as the rest of the area is privately owned. Best option to stay here to stay in cottages owned by local people.It costs 1000 Rs for a room on weekends. They offer konkani fish thali which is very sumptuous. Murud-Janjira Fort is situated on an oval-shaped rock off the Arabian Sea coast near the port town of Murud, 165 km (103 mi) south of Mumbai. Janjira is considered one of the strongest marine forts in India. The fort is approached by sailboats from Rajapuri jetty.The main gate of the fort faces Rajapuri on the shore and can be seen only when one is about 40 feet (12 m) away from it. It has a small postern gate towards the open sea for escape. Harihareshwar is a town in Raigad district, in Maharashtra, India. It is surrounded by four hills named Harihareshwar, Harshinachal, Bramhadri and Pushpadri. The river Savitri enters the Arabian Sea from the town of Harihareshwar. Towards the north of the town is the temple of Lord Harihareshwar, said to have been blessed by Lord Shiva. Hence Harihareshwar is often referred to as Dev-ghar or “house of God”. Besides a major pilgrimage center, Harihareshwar is a popular beach resort with two beaches, one to the north and the other to the south of the temple. Maharashtra Tourism Development Corporation has a resort on the south beach. Harihareshwar, along with Shrivardhan and Diveagar Beach forms a popular weekend beach destination from Pune (190 km) and Mumbai (210 km). Distance between Pune to Alibag is 145 km. pune to kashid distance is 185 km Alibag Kashid disance is 40 Km. Kashid Murud distance 20 kM. 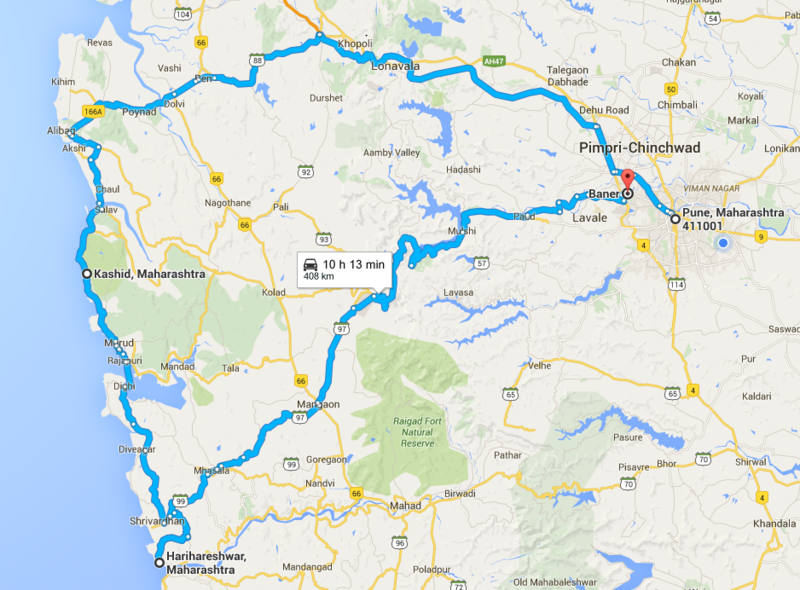 Rohini port to Harihareshwar is 50 km. Maximum 3 days are enough. Note: If you are planning to visit other beaches like devaghar, shrivardhan and more.. more time will be required. 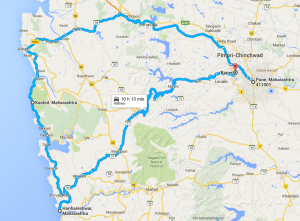 Hadapsar -> Old Highway -> Lonavla -> khopoli exit -> Khopoli -> Pen -> Alibhag -> Kashid. Kashid-> Murud -> Janjira fort -> Shrivardhan (By boat) -> Harihareshwar. It took around 5 and half hours to reach Kashid including 45 mins halt. Harihareshwar beach and site seeing. Water sports at Kashid beach. 1. We started from Hadapsar around 8:30 AM by route mentioned above. Took halt after Pen for lunch. 2. After reaching kashid we just checked-in to hotel,got fresh and went to see janjira fort. There will be entry charges and parking charge that u need to pay there. 3. Took boat ticket(25/- per person). Saw fort and after that went to Murud beach. Had dinner there(Thali’s are available there) and returned to Kashid. 1.Got up early and went to beach around 6:15 am. Had long walk. Enjoyed water and climate. 3. After murud there is Agardanda port from where there is option of ferry (ship in which we can load car) and reach other end i.e., near Dighi Port insteading of travelling by road. They charge 140/- for car and 20 per person. 4. Reached Harihareshwar around 2 pm. Went to mandir and sites near by. Had luch there. 5. While returning came by Tamini ghat. It was raining heavily that day. 6. started around 4: 30 pm and reached pune around 10 pm. 1. Boat to Janjira fort may not be available in rainy season. 2. Ships that carry cars are available on hourly basic. However timings keep changing so confirm once you reach there. 3. Don’t go deep into water as beaches may not be safe.